He didn't know where she came from and it didn't matter as he watched her wandering from yard to yard, crossing the street, dodging an occasional car. Calling to her with his warm voice, she knew that the man's body language meant safety and came right over, tail and fannie wagging incessantly. Coaxing her around the back of the house and up onto the smaller covered porch, he went into the garage and got the neatly folded heavy moving blanket and spread it on the flooring for her. Wagging with delight when she saw the little girl and the man's wife as they stood behind the sliding screen, she laid down on the blanket and watched as the young man filled a bowl with fresh cold water. As the wife filled yet another bowl with dry cat food and handed it to her husband, the dog's appreciation and gratitude came wriggling through as the wanderer devoured it. Then the phone calls began. First the local Vet, only to find he was closed because it was a Sunday. Because they had a close friend who worked at the Vet's office, she was next on the list. She gave them good advice. Telling them to get a rope and tie the dog, if possible, to prevent further wandering and to call the ACO (Animal Control Officer), which they did. Waiting for the ACO to call them back, the young man comforted the wanderer, noticing that she must have had puppies recently while the wife ran to the store to buy dog food since she was so hungry. Stroking her head and rubbing her ears, she laid her head in what seemed like such a comfortable lap. Loving the attention, her eyes closed slowly as she drifted off to sleep. After several hours, the ACO returned their call with news they almost hoped they wouldn't hear. A dog, fitting the description of the vagabond, had been reported missing in their neighborhood several hours ago. Waiting for the man to arrive, they again tried telling the dog to "Sit. Nothing. "Down." Nothing. "Paw." Nothing. A short time later the little old man, barely five feet tall, pulled in the driveway and walked around back with the young man. Picking her head up as the footsteps came around the corner,he wanderer was more happy to see her master, wagging excitedly. 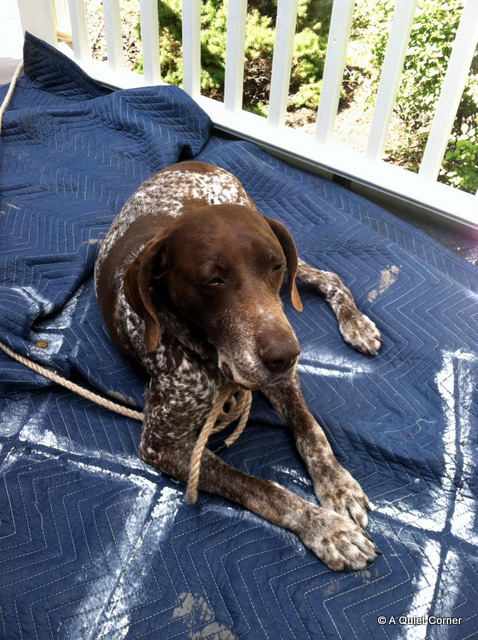 Meet Carla, the eight year old GSP (German Short-haired Pointer) who understands ITALIAN! One more thing. The names of the people in this story have been intentionally left out but between you and me, it was my son, my daughter-in-law and their little girl who reconnected Carla to her rightful owner. A dog who knows italian...how cool is that? I do love happy endings, particularly when a lost dog is reunited with its' owner ! "Bella " ! oh, so glad they were reunited! Great story and a big thank you to your son and family for finding her home again. So sweet. I had a sneaking suspicion that it was your son who rescued Carla and kept her safe. How funny that she's an Italian speaking dog. Sweet story with a happy ending. Hooray! So happy that Carla was reunited with her owner. Great story JP and kudos to your son and family for taking such good care of the wanderer. This is the last blog I'm visiting tonight, and I've enjoyed ending my reading with a great story with a happy ending!! :-)!!! A sweet story, JP, and sure Carla wagged her tail in Italian too.